A colorful collection of hand-painted powder room necessities. Sure to brighten your bath and delight your guests. 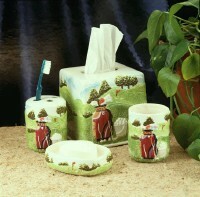 Four-piece ceramic set includes tissue holder, soap dish, toothbrush caddy and drinking cup. 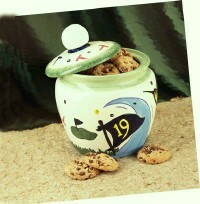 Hand-painted ceramic cookie jar with colorful golf motif makes a perfect centerpiece as it holds all sorts of home-baked goodies. DESCRIPTION Clips to golf bag and keeps essentials in one convenient place. 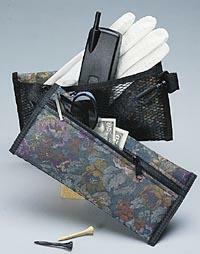 Padded water-resistant nylon with allover tapestry print has zip pocket for personals, sunglasses or cell phone. Mesh pocket with VelcroÆ closure allows glove to dry flat, helping retain its shape and softness. 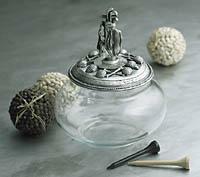 DESCRIPTION Glass jar with pewter lid serves as a great little reminder of your all-time favorite pastime. Fill with tees, paper clips, or even candy, and it's a hole-in-one gift for any links lover! Stands 5 high. DESCRIPTION Music to every golfer's ears...indoor/outdoor two-sided chimes are crafted with precise detailing from Statesmetal , a strong pewter-like alloy that won't chip, crack or rust. Assembled with braided nylon cord that has a lifetime guarantee. 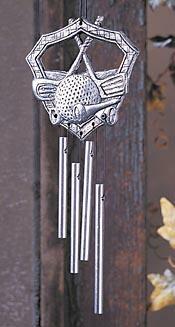 Chimes measure 2-1/2" x 7". Retro beverage accessories with a golf twist. 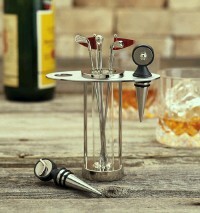 Set includes six stainless steel drink sticks with assorted golf tops, two wine stoppers, and chrome stand with glass insert. A great addition to any wed bar. Assembled set stands 6-1/4" high. DESCRIPTION Top off a good bottle of wine with a delightful twist of golf. 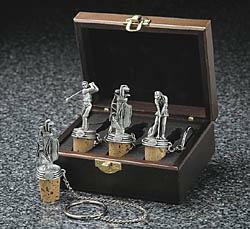 Handcrafted from pewter with natural corks, these stoppers will make a lovely addition to your collection of wine accessories. 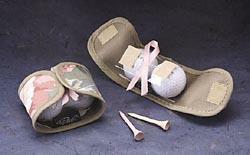 Set of three includes one each of male and female golfers, plus golf bag. Comes in wooden box (5-1/2"L x 4-1/4"W x 2-1/2"H) with hinged lid. A wonderful gift for your favorite connoisseur! Golf Bag Wine Stopper. 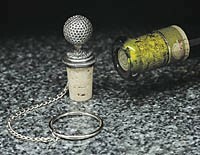 Handcrafted pewter wine stopper with natural cork give a golf flair to any connoisseur's collection. Top off a good bottle of wine with a delightful twist of golf. 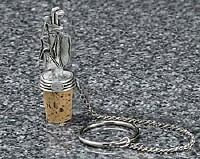 Handcrafted from pewter with natural corks. Is that wine mine? Help guests keep track of their glasses at all your golf gatherings with these stylishly fun golf charms. 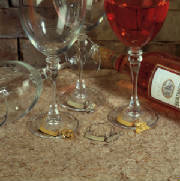 Shiny silver and gold metal charms have a small wire loop that slips around any stemware. Set of four charms includes golf bag, shoes, cart and crossed clubs heart. 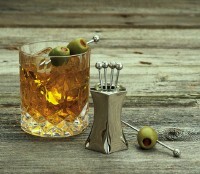 Stainless steel drink sticks with a stylish golf flair. Set of six sticks includes two each of flag, golf ball and club. 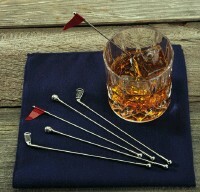 Each measures 6-1/4"L.
Stainless steel cocktail sticks with golf ball tops give beverages a golf twist. Set of six sticks stand stylishly in their sleek chrome holder. Each measures 3-1/2"L.